The iconic Changeable Disk Camera, originally introduced in 1968, is back for a new generation of children to enjoy. This adorable camera features interchangeable picture disks that are advanced by pressing the "shutter" button. 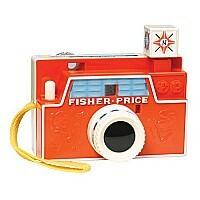 Other features includes a take along strap for the aspiring photographer on the go and a rotating flash cube.